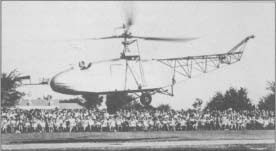 Igor Sikorsky pilots his craft, the VS-300, close to the ground in this 1943 demonstration. 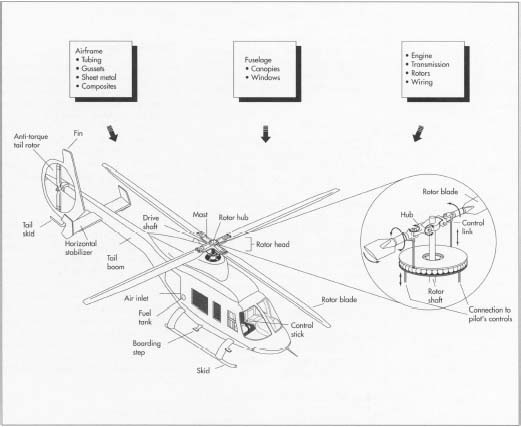 Most of the crucial components in a helicopter are made of metal and are formed using the usual metal-forming processes: shearing, blanking, forging, cutting, routing, and investment casting. The polycarbonate windscreen and windows are made by laying the sheet over a mold, heating it, and forming it with air pressure in a process called 'freeblowing," in which no tool ever touches the part. subject to bird strike or other impact may be laminated of two sheets for greater thickness. All such parts are made by placing an oversized blank on a fixture, heating it, and then forming it to the required curvature by use of air pressure in a freeblowing process. In this method, no tool surface touches the optical surfaces to cause defects. For the record, the H-53 has a seven-bladed main rotor. This site claims that rotor systems consist of between two and six blades. Obviously this is not true. I always find it frustrating how authors of aviation related articles do not understand the theory of flight. A rotary wing (any wing for that matter) generates lift NOT by forcing air downward from itself, but by producing a low pressure area ABOVE the wing. The curvature on the upper part of a wing makes the air travelling over it move faster than the air below the wing - and since the upper air molecules are spread apart more (moving faster), a slight vacuum is created. Since nature abhors a vacuum, the wing tends to move upward to fill the void (or low pressure area) as a result. This is why it is called lift - not 'push' or upward thrust. Lift. Simple. well, david, I have to say you seem to be a little rude. It's true, what you explain, but it is also true what the article says! David, your right, that is the principle behind flight. I too, find it frustrating that people often fail to explain the theory of flight correctly. even though the air is forced down and the rotor creates a fan-like machine, to say that a rotor creates upward thrust and that it is, in essence, a jet engine forcing the craft upward is entirely incorrect. The rest of the article was very interesting and as far as I know, accurate. Sikorsky was polish but was from Ukrainian cpital Kiev. Had nothing to do with Russia . It was part of Soviet Union.